Since the late 1500s, florilegia, or “flower books,” have been created as botanically accurate renderings of living plant collections. While the earliest published florilegia existed solely as compilations of paintings of plants from European flower gardens, they have come to play a valuable role in botanical and historical documentation. Now, with the increasing popularity of botanical art and the growing number of talented artists turning to botanical art, the florilegium is experiencing new life. Part of this new life is new media. Digital collections of art can reach a far wider audience than the big, expensive volumes of the past, and while some florilegia are still created to be curated art collections, a growing number are going digital. 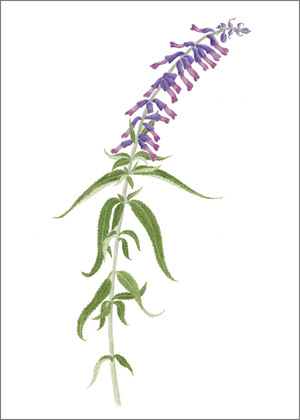 A digital florilegium is one that presents its collection online. Viewers can browse the works of the florilegium, zoom in to see intricate plant details, follow links to the artists’ other works, and read interpretive materials. The advantage of a digital collection over a curated collection is that these works of botanical art are always available for viewing online—no physical exhibit is required. The Sonoran Desert Florilegium Program will soon begin soliciting works for its digital florilegium. 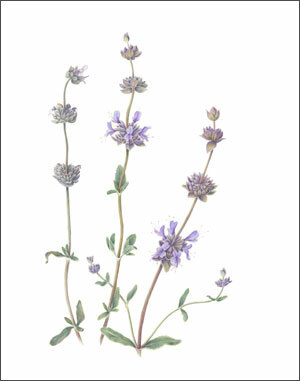 Artists from the Southwest Society of Botanical Artists (SWSBA) and other artists who have participated in the Florilegium Program’s exhibits will be invited in early 2015 to submit their art, and in the spring, jurors Linnea Gentry, Matt Johnson, Gene Joseph, and Margaret Pope will select works from this first set of submissions. Artists will retain their original art and copyright, but will give the Florilegium Program high-resolution digital images. This arrangement will allow a high-quality online presentation and the possibility of future publication. The florilegium sponsored by the Tucson Cactus and Succulent Society is just one of several florilegia that have been established in the United States in recent years. The two best known florilegia in the U.S. were both established in 2000. 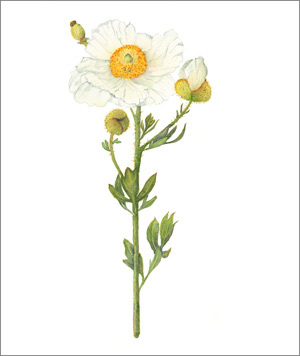 In New York, the Brooklyn Botanic Garden Florilegium documents the plants in the Garden’s extensive collection, and on the West Coast, the Filoli Florilegium in Woodside, California, documents the plants growing on the grounds of the historic estate. Two florilegia were started in 2006 in the California Bay Area by artist Catherine Watters, and both can be seen online. The Quarryhill Florilegium in Glen Ellen documents selections from one of the largest collections of temperate Asian plants in North America. The Gardens at Heather Farm Florilegium in Walnut Creek was compiled between 2006 and 2009 by Watters and her students. In 2010, the Minnesota School of Botanical Art (MSBA), led by artist Marilyn Garber, partnered with the oldest public wildflower garden in the U.S. to create The Eloise Butler Wildflower Garden Florilegium. Currently on exhibit at the Minneapolis Central Library are 50 paintings of native plants from the Garden by students and instructors of the MSBA. A number of the works can be seen online. 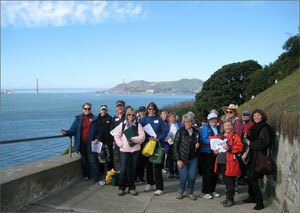 The Gardens of Alcatraz Florilegium, the newest of these florilegia, is a fascinating and remarkable project. 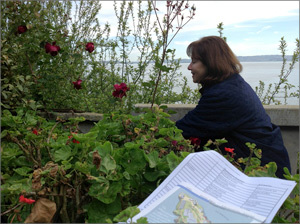 The Northern California Society of Botanical Artists (NCalSBA) has partnered with The Garden Conservancy in the creation of a florilegium to document the plants from the historic gardens of Alcatraz Island. The idea for the Florilegium was conceived in 2012 by artists Lyn Dahl, Sally Petru, and Catherine Watters, who worked closely with Shelagh Fritz, the Garden Conservancy’s project manager. Participating artists of the NCalSBA first visited the island in the spring of 2013, and in a matter of months an exhibit of 45 works opened in September of 2013 in the Prison Band Rehearsal Room on Alcatraz Island. Since that exhibit, an additional 14 works have been added to the Florilegium. These paintings and drawings can be seen online at the NCalSBA website's Alcatraz Florilegium Gallery. Even before it housed the infamous prison, Alcatraz was a forbidding place. Winds are harsh, the surrounding water is cold, and the only fresh water available comes from fog and the winter rains. The rocky island was perfect for nesting seabirds, but not for much else. Beginning in the 1850s, the military and later the federal prison system devoted immense effort to taming the island. Soil was brought in to fill areas damaged by construction, trees and groundcovers were planted to control erosion, and ornamental gardens were planted to soften the stark environment. The original gardens of Alcatraz were planted by soldiers and their families when the island served as a military fortress. These early gardeners introduced many ornamental plants typical of a Victorian flower garden, but most of the plants selected over the years for this difficult site had to be of a more practical nature. Enterprising gardeners discovered that California natives performed well as did durable Mediterranean plants. Agaves thrived, as did other succulents such as aeonium, sedum, and drosanthemum. Drought-tolerant plants from the Sonoran and Mohave Deserts fared well on the dry and windy west side of the island. In 1933, the island became home to the federal penitentiary, and the gardens, now tended by inmates and prison staff, flourished. But thirty years later, escalating costs and deteriorating buildings forced the closure of the prison. The gardens were abandoned, overtaken by “weeds” and nesting birds. The island was transferred to the National Park Service in 1972 to become part of the Golden Gate National Recreation Area. Restoration of the Gardens of Alcatraz began in 2003, when The Garden Conservancy and the Golden Gate National Parks Conservancy formed a partnership with the National Park Service. Gardens on the 22-acre island have been beautifully restored and are being maintained by volunteers with The Garden Conservancy. More about the restoration process, including a listing of the gardens’ historic “survivor” plants, can be found at the Gardens of Alcatraz website. This appeared in the October 2014 issue of The Desert Breeze, the monthly newsletter of the Tucson Cactus and Succulent Society.